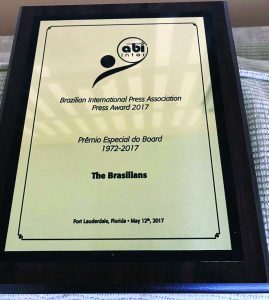 During the 20th edition of the Brazilian International Press Award, which took place last May in Florida, The Brasilians Newspaper was honored with the special award “Jubileu”, for its 45 years of uninterrupted publication that will be celebrated this year. The Brazilians, founded in 1972, is the oldest newspaper among Brazilian community newspapers currently published in the U.S. It is also the only newspaper published in Portuguese and English since its very first edition. The tribute was paid by the International Brazilian Press Association (ABI Inter in Portuguese), whose board chooses the honorees who receive special awards. The Brazilian International Press Award has the mission of celebrating the culture and positive image of Brazil and Brazilians abroad by honoring personalities, entities and individual or collective initiatives that are considered deserving of these tributes. The honorees are chosen by popular vote. Created in 1997 by the journalist and producer Carlos Borges, the Brazilian International Press Award became one of the most relevant celebrations of Brazilian culture in the international arena. The event has just held its 20th edition. Since 2011, The Brazilian International Press Award has expanded to Europe (London) and Asia (Tokyo), effectively becoming the most comprehensive celebration of Brazilian talent and presence abroad. In 2014 it had a special edition in Oslo (Norway). Since its creation, many Brazilian celebrities have already landed in Florida, where the event takes place, to receive their awards. Among them are the singers Jorge Ben Jor and Toquinho, the artist Romero Britto, the writers João Ubaldo Ribeiro and Nélida Piñon, the basketball player Hortência, and many others.